This has been a pretty tough winter so far, here in Michigan… lots of snow; high temps struggling but often failing to get into double digits; low temps dropping below zero. Right this minute– Sunday, 3:30 pm, it’s 12 degrees out, with snow that’s been steadily falling all day long. 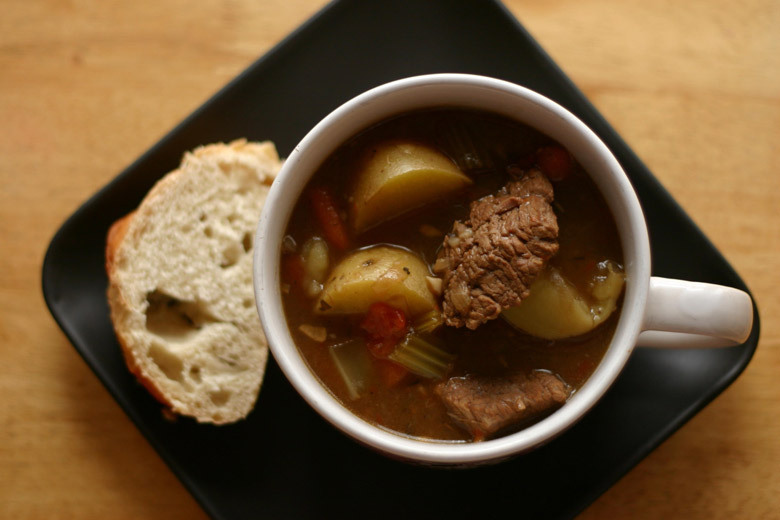 So this is the perfect day to get a fire going and make some good old-fashioned cold-weather comfort food: beef stew, pretty much like mom used to make. 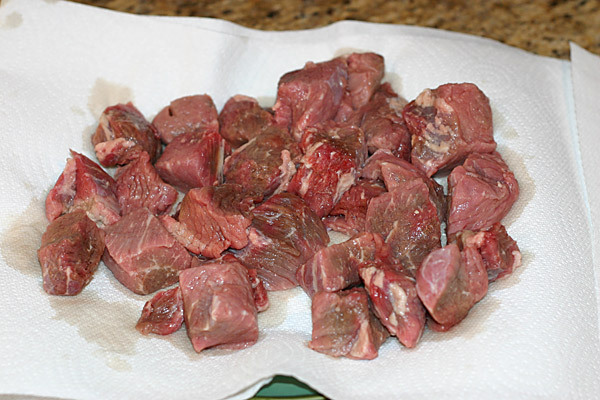 Cut up your stewing beef into bite-sized chunks– around 1″ to 1 1/2″ cubes. 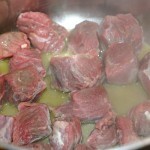 Stewing beef is generally a cheaper cut that would be too tough cooked like a steak, but is perfect slow-cooked in a stew until it’s tender. Chuck steak is good for this. 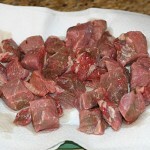 If you want to save a little time you can often find pre-cut meat labeled “stewing beef” at the store. Cut the vegetables up. Dice the onions and mince the garlic into small pieces, but the rest of the veggies like carrots and celery, the more visible veggies, can be cut into more chunky pieces. I added a red pepper because I like the flavor, plus it adds some more vitamins to the stew, but I made this an optional ingredient because it wasn’t in mom’s stew. Your chunks of beef need to be completely dry so they can be seared, so blot them down with some paper towel if you need to. This is important, because we want to brown the meat for flavor– not steam it. Add the butter or oil to a large pot (big enough for the whole stew– this is one of those nice easy one-pot meals). Turn the heat on high. When it’s sizzling, add the meat, and give it a few minutes to get nice and browned on each side before turning each piece over to brown the whole surface of each piece.When the meat is browned, remove it and pour out any excess grease from the meat, leaving just a little bit. Add the chopped up vegetables and cook while stirring until the onions start to soften up a little. Now add a nice generous splash of red wine and stir up the brown stuff on the bottom of the pan from the seared meat. Cook long enough to let the wine reduce some and cook off the alcohol (our kids are going to be eating the stew too). 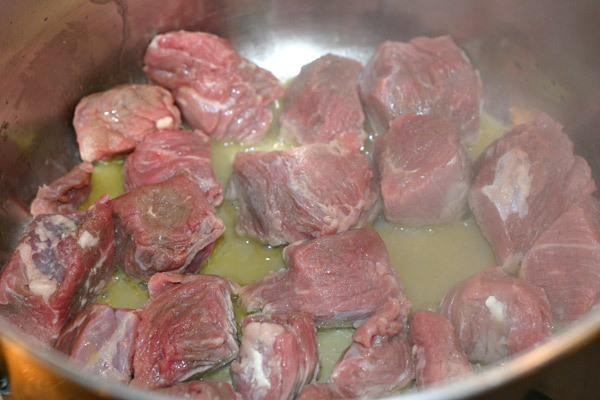 Add the beef stock, put the beef back in, and add all the seasonings at this point and bring to a simmer. Cook on a very slow simmer for 2-3 hours. While the stew is simmering, wash and scrub the outside of the potatoes. Peel the potatoes if you want, but I leave the skins on because it adds more fiber, and I like the taste of potato skins (plus, it’s one less thing to do!). Cut the potatoes into bite-size pieces, about the same size as the beef. Add the potatoes in the last 1/2 hour of the cooking time– they don’t take too long. Stick a fork in a sample potato piece to see if it’s done. When the potatoes are ready, mix the 3 tablespoons of flour with an equal amount of water, adding the water slowly, and constantly stirring to make sure you get a smooth paste without any lumps of dry flour. It should have the consistency of pancake batter. Slowly add the flour-water paste to the beef stew while stirring the stew until it thickens up just to a gravy-like consistency. Heat and stir a little longer to make sure the flour is well-mixed in with the stew and the consistency is right (add a little water if it gets too thick), and it’s ready. Serving suggestion– serve with a nice chunk of crusty French-style bread to help mop up the “gravy”, preferably in front of a nice roaring fire if you have one. Enjoy!